Range is often determined by this method. There are two ways to estimate range visually. a. 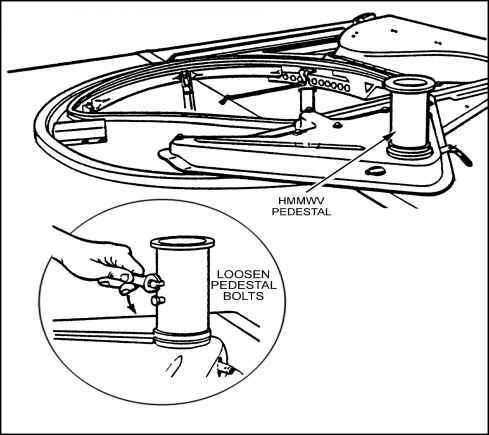 Using the 100-meter unit-of-measure method, visualize 100 meters on the ground (this takes practice) and determine how many units of 100 meters there are to the target (Figure 5-4). 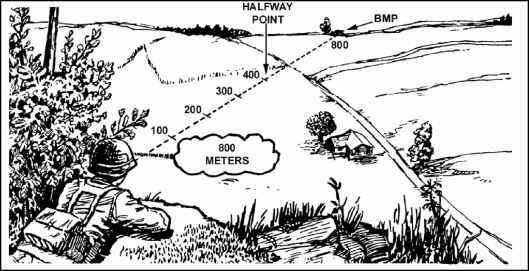 For targets more than 500 meters (5 units) away, pick a point about halfway, estimate the range to that point, and double it (Figure 5-5). Figure 5-4. Application of the 100-meter unit-of-measure method for ranges up to 500 meters. Figure 5-5. Application of the 100-meter unit-of-measure method for ranges greater than 500 meters. b. Use the appearance-of-objects method, which is fairly reliable, to determine range (this also takes practice). Memorize the sizes and shapes of familiar objects at different ranges. Consider the factors in Table 5-1, which affect the appearance of objects. The clarity of outline and details of the target. When most of the target is visible and a clear outline can be seen. When the target is in sharp contrast with the background or is silhouetted because of its size, shape, or color. When seen in the clear air or high altitudes. When only a small part of the target can be seen or the target is small in relation to its surroundings. When vision is narrowly confined as in streets, draws, or forest trails. In poor light such as dawn and dusk; in rain, snow, fog; or when the sun is in the observer's eyes. When the target blends into the background or terrain. Table 5-1. Factors affecting visual range estimation.